Alex Chatt celebrates a point. 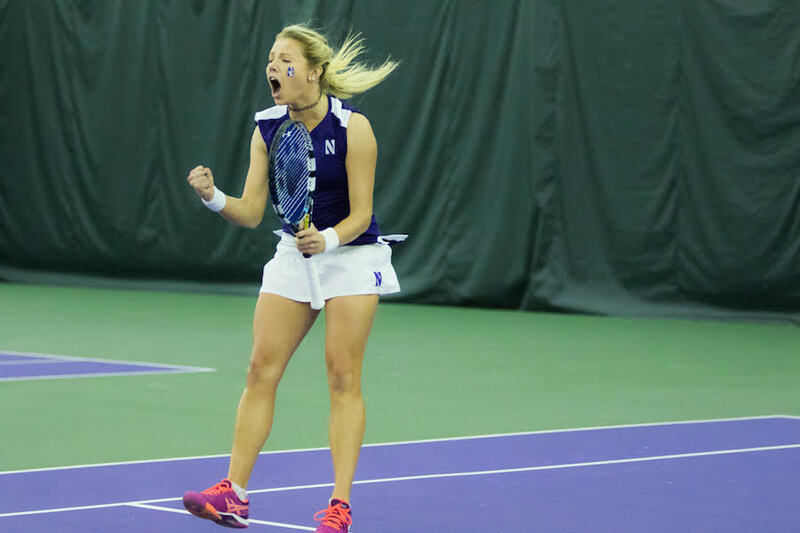 The junior logged two wins but Northwestern dropped its weekend matches. Northwestern entered the weekend with a chance to steal wins over two top-10 opponents, but fell short against both No. 9 Vanderbilt and No.10 Duke. Despite strong singles wins from junior Alex Chatt, the No. 23 Wildcats (4-3) lost 5-2 to the Commodores (4-1) on Friday, and were edged 4-3 by the Blue Devils on Sunday. Vanderbilt came in boasting an undefeated record and the No. 2 and No. 28 singles players in the country. The Commodores also clinched a berth to ITA Indoor Nationals a week earlier. The Cats fell behind early, losing the doubles point and the first two singles points. After a win from Chatt, sophomore Rheeya Doshi lost to the Commodores’ Georgina Sellyn 4-6, 6-4, 7-5 as Vanderbilt solidified its win. Chatt was one of the few bright spots for NU and pulled out a 3-set win, 2-6, 6-3, 6-4. Junior Maddie Lipp also picked up her first singles win in almost a month, upsetting No. 28 Christina Rosca of Vanderbilt 5-7, 6-3, 6-3. NU quickly returned to action Sunday in Durham for a rematch against Duke, seeking to flip the script from the match a week earlier. On Jan. 29, the Cats fell to the Blue Devils 4-3, with Maddie Lipp conceding the decisive point in a tiebreaker against Duke’s No. 14 Meible Chi. The Cats found themselves in almost an identical situation in the rematch, grabbing the doubles point behind wins from the pairs of Doshi and Lee Or, and Erin Larner and Brooke Rischbieth. However, the team struggled in singles play, only picking up wins from Larner and Chatt. In a 3-3 tie entering the final match, Rischbieth fell to Duke’s Rebecca Smaller 7-5, 7-6 (7-5). After four matches in a seven-day span, the Cats will now return home to rest until Feb. 17, when they host Baylor. Against the Bears, NU will look to bounce back from three-straight losses after a 4-0 start to the year.